Playing their second fixture in three days, Cookstown headed to the Glade on Friday evening to line out against bottom of the table Mossley. In stark contrast to Wednesday’s meeting with Kilkeel, the Reds took an early stronghold on the game and never really looked like letting go throughout. They raced to an early 3-0 lead courtesy of two short corner deflections from Jon Ames coupled with a reverse stick shot from Greg Allen with 20 minutes gone. Mossley hit back with one of their own shortly thereafter; a controversial penalty corner fired home by captain Neal Glassey, inspiring the Glade faithful with prospects of a comeback. With umpiring decisions rattling the Cookstown players, three players saw the sin-bin before the close of the first, casting a dampener upon Town’s bright start to the game. Shortly after the halfway point, the Reds increased the goal margin when Ames found the Stewartstown Striker parked in his homeland, three yards from goal, to sweep in Cookstown’s fourth. Ames then completed his hat-trick, making it 5-1 to CHC, deflecting into the home goal from an Andy Barbour crash ball along the right hand side. Captain Greg Allen finished off the scoring for the evening, scrap-hunting off a Stuart Smyth drag flick to fire high into the Mossley goal and cap off a convincing victory for the Town. 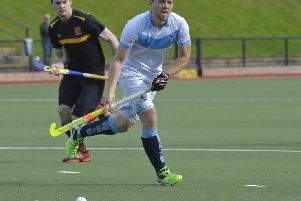 Cookstown will face Mossley HC at Steelweld Park on Friday night. The game started sleepily for Cookstown whose nonchalant start should have seen them several goals down, only for the goalkeeping heroics of Ian Hughes. Despite the early pressure, Cookstown found a way through the Co. Down press and won their first penalty corner of the game via some Paul Thompson skulduggery down the right hand side. Mark Crooks was on cue to convert and give CHC a 1-0 lead, slapping into an empty goal after a slip ball from Greg Allen eliminated the goalkeeper from the equation. Seemingly unfazed by the opener, Kilkeel continued to exploit Cookstown’s slow start but were unable to forge an equaliser before the halftime whistle sounded. Town increased their goal margin just after the restart when Ewan Butler intercepted a loose ball and played through veteran Andrew Barbour who shimmied his way past the home GK and passed home the Red’s second, bringing a welcomed two goal cushion to the away side. The sides fought tooth and nail for the remainder of the game, with several players seeing green and yellow for the contest. Kilkeel continued to knock at the door but were sent astray by the dynamic Hughes. Cookstown squandered several of their own chances throughout the second but never really found rhythm to dictate the game and the score line closed out at 2-0.